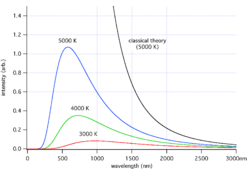 Black-body radiation curves at different temperatures: 3000 K, 4000 K, and 5000 K. As the temperature decreases, the peak of the black-body radiation curve moves to lower intensities and longer wavelengths. The black-body radiation graph is also compared with the classical model of Rayleigh and Jeans. In physics, a black body (in an ideal sense) is an object that absorbs all electromagnetic radiation that falls on it, without any of the radiation passing through it or being reflected by it. Because it does not reflect or transmit visible light, the object appears black when it is cold. When heated, the black body becomes an ideal source of thermal radiation, which is called black-body radiation. If a perfect black body at a certain temperature is surrounded by other objects in equilibrium at the same temperature, it will on average emit exactly as much as it absorbs, at the same wavelengths and intensities of radiation that it had absorbed. The temperature of the object is directly related to the wavelengths of the light it emits. At room temperature, black bodies emit infrared light, but as the temperature increases past a few hundred degrees Celsius, black bodies start to emit at visible wavelengths, from red through orange, yellow, and white before ending up at blue, beyond which the emission includes increasing amounts of ultraviolet radiation. The color (chromaticity) of black-body radiation depends on the temperature of the black body. The locus of such colors (shown here in CIE 1931 x,y space) is known as the Planckian locus. Black bodies have been used to test the properties of thermal equilibrium because they emit radiation that is distributed thermally. In classical physics, each different Fourier mode in thermal equilibrium should have the same energy, leading to the theory of ultraviolet catastrophe that there would be an infinite amount of energy in any continuous field. Studies of black-body radiation led to the revolutionary field of quantum mechanics. In addition, black-body laws have been used to determine the black-body temperatures of planets. If a small window is opened into an oven, any light that enters the window has a very low probability of leaving without being absorbed. Conversely, the hole acts as a nearly ideal black-body radiator. This makes peepholes into furnaces good sources of blackbody radiation, and some people call it cavity radiation for this reason. In the laboratory, black-body radiation is approximated by the radiation from a small hole entrance to a large cavity, a hohlraum. Any light entering the hole would have to reflect off the walls of the cavity multiple times before it escaped, in which process it is nearly certain to be absorbed. This occurs regardless of the wavelength of the radiation entering (as long as it is small compared to the hole). The hole, then, is a close approximation of a theoretical black body and, if the cavity is heated, the spectrum of the hole's radiation (i.e., the amount of light emitted from the hole at each wavelength) will be continuous, and will not depend on the material in the cavity (compare with emission spectrum). By a theorem proved by Gustav Kirchhoff, this curve depends only on the temperature of the cavity walls. Kirchhoff introduced the term "black body" in 1860. Calculating this curve was a major challenge in theoretical physics during the late nineteenth century. The problem was finally solved in 1901 by Max Planck as Planck's law of black-body radiation. By making changes to Wien's Radiation Law (not to be confused with Wien's displacement law) consistent with thermodynamics and electromagnetism, he found a mathematical formula fitting the experimental data in a satisfactory way. To find a physical interpretation for this formula, Planck had then to assume that the energy of the oscillators in the cavity was quantized (i.e., integer multiples of some quantity). Einstein built on this idea and proposed the quantization of electromagnetic radiation itself in 1905 to explain the photoelectric effect. These theoretical advances eventually resulted in the superseding of classical electromagnetism by quantum electrodynamics. Today, these quanta are called photons and the black-body cavity may be thought of as containing a gas of photons. In addition, it led to the development of quantum probability distributions, called Fermi-Dirac statistics and Bose-Einstein statistics, each applicable to a different class of particle, which are used in quantum mechanics instead of the classical distributions. 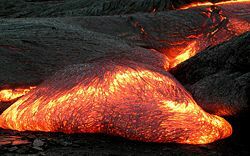 The temperature of a Pāhoehoe lava flow can be estimated by observing its color. The result agrees well with the measured temperatures of lava flows at about 1,000 to 1,200 °C. The wavelength at which the radiation is strongest is given by Wien's displacement law, and the overall power emitted per unit area is given by the Stefan-Boltzmann law. So, as temperature increases, the glow color changes from red to yellow to white to blue. Even as the peak wavelength moves into the ultra-violet, enough radiation continues to be emitted in the blue wavelengths that the body will continue to appear blue. It will never become invisible — indeed, the radiation of visible light increases monotonically with temperature. The radiance or observed intensity is not a function of direction. Therefore a black body is a perfect Lambertian radiator. Real objects never behave as full-ideal black bodies, and instead the emitted radiation at a given frequency is a fraction of what the ideal emission would be. The emissivity of a material specifies how well a real body radiates energy as compared with a black body. This emissivity depends on factors such as temperature, emission angle, and wavelength. However, it is typical in engineering to assume that a surface's spectral emissivity and absorptivity do not depend on wavelength, so that the emissivity is a constant. This is known as the grey body assumption. Although Planck's formula predicts that a black body will radiate energy at all frequencies, the formula is only applicable when many photons are being measured. For example, a black body at room temperature (300 K) with one square meter of surface area will emit a photon in the visible range once every thousand years or so, meaning that for most practical purposes, the black body does not emit in the visible range. When dealing with non-black surfaces, the deviations from ideal black-body behavior are determined by both the geometrical structure and the chemical composition, and follow Kirchhoff's Law: emissivity equals absorptivity, so that an object that does not absorb all incident light will also emit less radiation than an ideal black body. 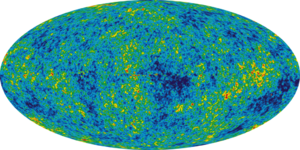 WMAP image of the cosmic microwave background radiation anisotropy. It has the most precise thermal emission spectrum known and corresponds to a temperature of 2.725 kelvin (K) with an emission peak at 160.2 GHz. 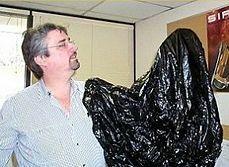 In astronomy, objects such as stars are frequently regarded as black bodies, though this is often a poor approximation. An almost perfect black-body spectrum is exhibited by the cosmic microwave background radiation. Hawking radiation is black-body radiation emitted by black holes. A typical conical cavity-type black body. Although a black body is a theoretical object, (i.e. emissivity (e) = 1.0), common applications define a source of infrared radiation as a black body when the object approaches an emissivity of 1.0, (typically e = .99 or better). 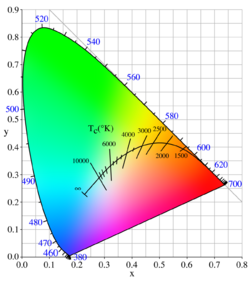 A source of infrared radiation less than .99 is referred to as a greybody. Applications for black body simulators typically include the testing and calibration of infrared systems and infrared sensor equipment. 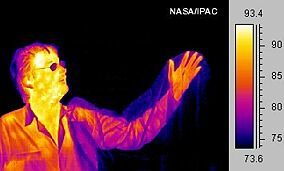 Much of a person's energy is radiated away in the form of infrared energy. Some materials are transparent to infrared light, while opaque to visible light (note the plastic bag). Other materials are transparent to visible light, while opaque or reflective to the infrared (note the man's glasses). Black-body laws can be applied to human beings. For example, some of a person's energy is radiated away in the form of electromagnetic radiation, most of which is infrared. The total energy radiated in one day is about 9 MJ (Mega joules), or 2000 kcal (food calories). Basal metabolic rate for a 40-year-old male is about 35 kcal/(m²•h), which is equivalent to 1700 kcal per day assuming the same 2 m² area. However, the mean metabolic rate of sedentary adults is about 50 percent to 70 percent greater than their basal rate. There are other important thermal loss mechanisms, including convection and evaporation. Conduction is negligible since the Nusselt number is much greater than unity. Evaporation (perspiration) is only required if radiation and convection are insufficient to maintain a steady state temperature. Free convection rates are comparable, albeit somewhat lower, than radiative rates. Thus, radiation accounts for about 2/3 of thermal energy loss in cool, still air. Given the approximate nature of many of the assumptions, this can only be taken as a crude estimate. Ambient air motion, causing forced convection, or evaporation reduces the relative importance of radiation as a thermal loss mechanism. This is why thermal imaging devices designed for human subjects are most sensitive to 7–14 micrometers wavelength. The nanometer is a convenient unit of measure for optical wavelengths. Note that 1 nanometer is equivalent to 10−9 meters. Here is an application of black-body laws to determine the black body temperature of a planet. The surface may be warmer due to the greenhouse effect. Energy generated internally by a planet itself (due to Radioactive decay, tidal heating and adiabatic contraction due to cooling). For the inner planets, incident and emitted radiation have the most significant impact on temperature. This derivation is concerned mainly with that. The Sun and the Earth both radiate as spherical black bodies. The Earth is in thermal equilibrium. 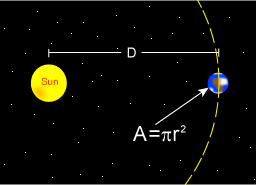 then we can derive a formula for the relationship between the Earth's temperature and the Sun's surface temperature. The Earth only has an absorbing area equal to a two dimensional circle, rather than the surface of a sphere. is the distance between the Sun and the Earth. is the albedo of Earth. where is the black body temperature of the earth. Many factors cancel from both sides and this equation can be greatly simplified. is the blackbody temperature of the Earth. In other words, given the assumptions made, the temperature of Earth depends only on the surface temperature of the Sun, the radius of the Sun, the distance between Earth and the Sun and the albedo of Earth. where v is the velocity of the source in the observer's rest frame, θ is the angle between the velocity vector and the observer-source direction, and c is the speed of light. This is the fully relativistic formula, and can be simplified for the special cases of objects moving directly towards ( θ = π) or away ( θ = 0) from the observer, and for speeds much less than c.
This is an important effect in astronomy, where the velocities of stars and galaxies can reach significant fractions of c. An example is found in the cosmic microwave background radiation, which exhibits a dipole anisotropy from the Earth's motion relative to this blackbody radiation field. ↑ When used as a compound adjective, the term is typically hyphenated, as in "black-body radiation," or combined into one word, as in "blackbody radiation." The hyphenated and one-word forms should not generally be used as nouns. ↑ Max Planck, 1901. On the Law of Distribution of Energy in the Normal Spectrum. Annalen der Physik. 4:553. Retrieved December 15, 2008. ↑ What is a Black Body and Infrared Radiation? Electro Optical Industries, Inc. Retrieved December 15, 2008. ↑ Emissivity Values for Common Materials. Infrared Services. Retrieved December 15, 2008. ↑ Emissivity of Common Materials. Omega Engineering. Retrieved December 15, 2008. ↑ Abanty Farzana, 2001. Temperature of a Healthy Human (Skin Temperature). The Physics Factbook. Retrieved December 15, 2008. ↑ B. Lee, Theoretical Prediction and Measurement of the Fabric Surface Apparent Temperature in a Simulated Man/Fabric/Environment System. dsto.defence.gov.au. Retrieved December 15, 2008. ↑ J. Harris, and F. Benedict. 1918. A Biometric Study of Human Basal Metabolism. Proc Natl Acad Sci USA 4(12):370–373. ↑ J. Levine, 2004. Nonexercise activity thermogenesis (NEAT): environment and biology. Am J Physiol Endocrinol Metab. 286:E675–E685. Retrieved December 15, 2008. ↑ Heat Transfer and the Human Body. DrPhysics.com. Retrieved December 15, 2008. ↑ George H.A. Cole, Michael M. Woolfson. 2002. Planetary Science: The Science of Planets Around Stars, 1st ed. (Institute of Physics Publishing. ISBN 075030815X), 36–37, 380–382. ↑ John M. McKinley, 1979. Relativistic transformations of light power. Am. J. Phys. 47(7). Cole, George H.A., Michael M. Woolfson. 2002. Planetary Science: The Science of Planets Around Stars. Bristol, UK: Institute of Physics Publishing. ISBN 075030815X. Gill, T. P. 1965. The Doppler Effect. London, UK: Logos Press. Harris, J. and F. Benedict. 1918. A Biometric Study of Human Basal Metabolism. Proc Natl Acad Sci USA 4(12):370–373. Huang, Kerson. 1967. Statistical Mechanics. New York, NY: John Wiley & Sons. Kroemer, Herbert, and Charles Kittel. 1980. Thermal Physics, 2nd ed. W. H. Freeman Company. ISBN 0716710889. Landau, L. D., and E. M. Lifshitz. (original 1958) 1996. Statistical Physics, 3rd Edition, Part 1. Oxford, UK: Butterworth-Heinemann. Tipler, Paul, and Ralph Llewellyn. 2002. Modern Physics, 4th ed. W. H. Freeman. ISBN 0716743450. All links retrieved June 11, 2016. Calculating Blackbody Radiation Interactive calculator with Doppler Effect. Includes most systems of units. Cooling Mechanisms for Human Body - From Hyperphysics. "Blackbody Spectrum" by Jeff Bryant, Wolfram Demonstrations Project. This page was last modified on 11 June 2016, at 16:01.